For more than 3 years Ciena has seen its components sales increasing in a continuous manner thanks to our partnership with AECI, they have proved to be a trustful and loyal broker who looks after customer and looks for win-win relationships. Cataloguing services , external audit, brokerage and warehousing have all been provided in a timely manner with efficiency always exceeding our expectations. 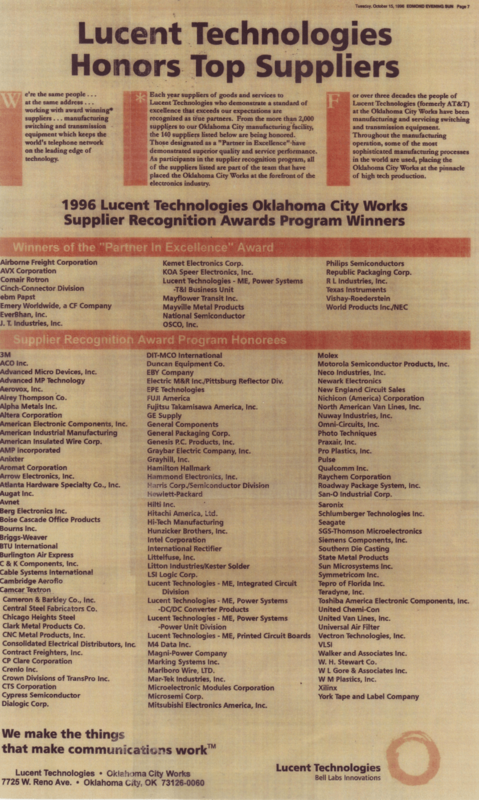 The National Aeronautics and Space Administration would like to recognize (AECI) American Electronics Components Incorporated for their continued dedication to prompt and professional support as a valued supplier of ground communications equipment and materials that support the daily process of the Space Shuttle program. AECI has provided superior performance and outstanding contributions toward the vision mission and goals of NASA at both Kennedy Space Center, and Marshall Space Flight Center. It should also be noted that their integrity, credibility and desire to take on responsibilities in support of whatever the object may be, puts them next to none. American Electronics Components has become an important GE supplier of e1ectronic piece parts and semiconductors. Consistently quoting to our requirements and following up after order placement are exemplary examples of your performance. Without suppliers such as American Electronic Components, we could not meet our contractual Commitments. Please express our appreciation to your employees and your management for your outstanding and dependable performance. 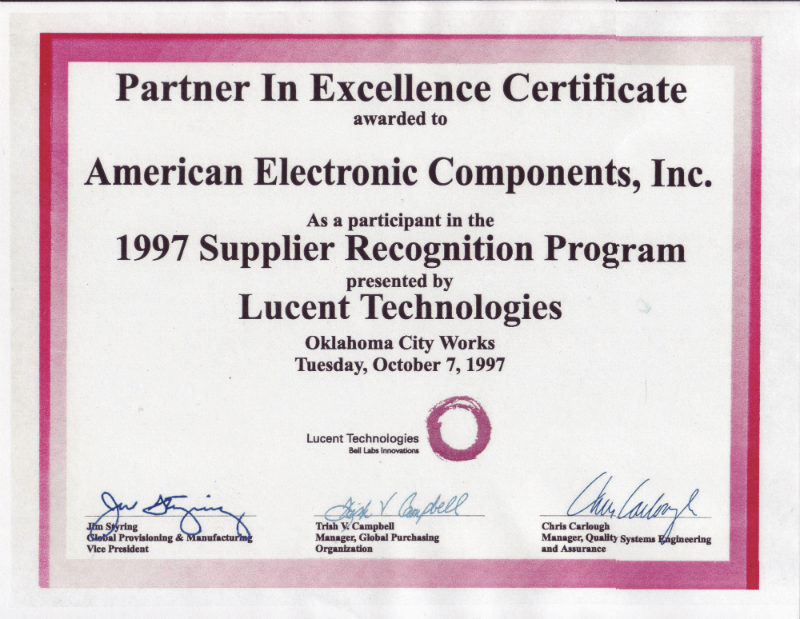 Lucent Technologies lnc. 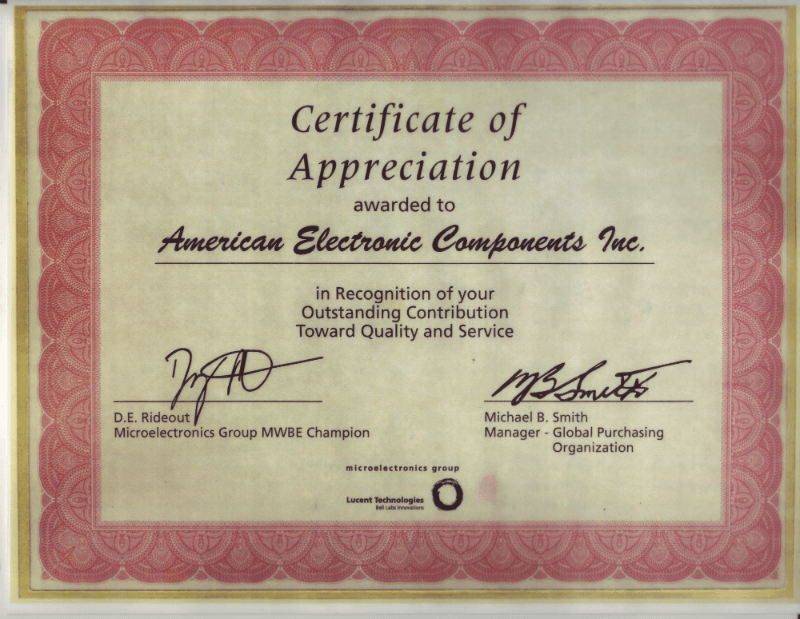 appreciates American Electronic Components, Inc. (AECI) role as one of our key suppliers. Their efforts have helped to improve our spare parts and equipment processes and reduce our costs. American Electronics Components has become an important supplier for piece parts and semiconductors to our repair business supporting 40 plus OEMs. Consistently quoting to our requirements and following up after order placement are exemplary examples of your performance. Without American Electronic Components as a supplier, we could not meet our contractual commitments. We are please express our appreciation to your employees and your management for your outstanding and dependable performance.